In the years since the first Android device debuted, we've seen dozens of forgettable handsets running Google's now-ubiquitous software. The Samsung Prevail would fall into that category, too – were it not for some tempting pricing. It costs $180 with no contract – a steal compared to other unsubsidized smartphones – and Boost Mobile is charging just $50 a month for unlimited data. Oh, and that plan doesn't include throttling, so you won't see your data speeds slow down after you chug one megabyte too many. So, is this generous data plan worth settling for a decidedly ho-hum device? You'll have to head on past the break to find out. At a time when 4.3-inch screens are fast becoming the norm, the Prevail feels decidedly lilliputian with its 3.2-inch touchscreen and bantamweight build. Flanking the top and bottom of the display are wide bands of empty space that house Samsung and Boost Mobile's respective logos. Other than that branding, the handset's front surface looks downright generic, thanks to those glowing haptic controls you'll find on any other Android handset . 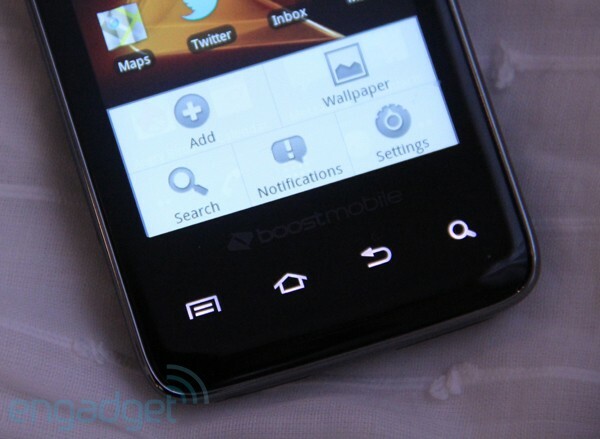 The familiar menu, home, return, and search icons are arranged in the same order as they are on other Samsung Android devices, such as the Epic 4G, though you'll find the same layout in the Droid 2 and others. We won't mince words: the Prevail looks the part of a low-end smartphone. The shiny band lining the sides and surrounding the lens and 3.5mm headphone jack is, of course, made of plastic, as opposed to any kind of metal. The backside has a soft, satiny material – an odd match for the rubber port cover shielding the microSD slot on the lower left edge of the phone. Incongruously, that's the only covered port, though the volume rocker, camera launch key, and tiny power button all have a similar rubbery feel. The 2 megapixel camera and speaker are both tucked on the top of the backside, which makes it easy to snap photos without accidentally obscuring the lens with your finger. (The speaker is loud even when you set the phone down face-up.) And, although that back cover stays put, all it takes is a fingernail to make the whole thing fall away. It's details like this that remind you the phone is serviceable at best. One of the best things about this diminutive phone is how light it feels in the hands – and how easy it is to stuff inside the pockets of even your skinniest jeans. The Prevail feels reminiscent of the Droid Eris, another low-end Android phone of yore – an apt comparison particularly given that both suffer from lagging, imprecise screens. To its credit, the Prevail's screen displays more vibrant colors than the original Droid, to make one comparison. But the touch experience is maddeningly inconsistent, and ended up being the lynch pin in our week-long experience with the Prevail. At times, the display responded snappily as we flipped through home screens. But in other instances the screen dragged as we scrolled through web pages and our Twitter feed. Worse, the display is overly sensitive, a flaw that permeates every application on the phone -- we constantly found ourselves tapping an incorrect link, selecting the wrong pinpoint on maps and, adding insult to injury, misfiring in Angry Birds. The Prevail's 800MHz Qualcomm processor is noticeably more sluggish than the dual-core 1GHz chips that the newest premium phones are sporting. To be sure, the wonky touchscreen is far more frustrating than the middling processing speeds, though you will notice more of a pause when you do things like open menus or launch apps. Still, we were impressed that it was able to keep our Angry Birds game running in the background, even after we pressed the home button to return to other applications, such as email. Call quality over Boost Mobile's network felt like a step down from the Verizon Wireless Droid we use on a daily basis. Callers described the sound as tinny, while conversations on our end sounded distant and muffled. To boot, the overzealous touchscreen reared its head during calls, giving haptic feedback when our face touched the screen. Moreover, ending conversations is unintuitive in that you have to press the lock button and then swipe a red ribbon across the screen to end the call. With the Droid, for instance, the proximity sensor is smart enough to know that you've been on a call, so when you pull your head away the device isn't locked. Then you tap a large icon, instead of swipe a less-than-responsive screen. The Prevail is rated for up to six and a half hours of talk time. After about 15 hours of checking email and Twitter regularly, playing Angry Birds during our commute, and making a handful of calls, including a lengthy one, we had a red sliver of battery life left. Another day, we spent the afternoon checking e-mail and Twitter and also finding directions to several destinations on Google Maps. After leaving the phone unplugged overnight, we still had a slim yellow bar of juice left, which isn't even the most dire battery life warning. At a time when smartphone makers are racing to cram larger sensors into their flagship handsets, Samsung was content to stick the Prevail with a low-resolution 2 megapixel camera. We were pleasantly surprised by the accurate, if slightly muted colors -- not to mention, the minimal shutter lag. The camera does falter, though, in even modestly backlit shooting conditions (check out the shot of luggage sitting in our sunny living room, for instance). It's also pretty useless for shooting close-ups, as you can see in a couple of our sample shots. The Prevail runs Android Froyo (2.2), which means that even though this isn't the most recent version of the OS, you'll still get Flash support, WiFi tethering, and improved Exchange integration. It's true that Gingerbread (2.3) adds gyroscope and NFC support, though a low-end phone like isn't likely to boast hardware that impressive, anyway. Although the Prevail appears to run a vanilla version of Android in that there are no widgets cluttering the home screens, Samsung has, in fact, made some tweaks to the software. Google Calendar, for instance, looks different with its black, not white, background. We prefer the continuity in appearance between Google's mobile and web apps, though the Prevail's calendar conveniently adds the ability to customize how far in advance you receive reminders for scheduled events. Thankfully, the Gmail app is the same as on other Android phones, as is the capable (though tab-less) stock browser. We noticed that once we added our Gmail account -- the same one we use on our Droid -- the Prevail didn't sync our apps, as other Android phones do. Certainly, the selection of bundled apps differs. The Prevail comes with Twidroyd, not Twitter's native Android app. Twidroyd offers more options to power users, including the ability to select a different visual theme, though it's lacking Twitter for Android's drag-to-refresh feature. In general, too, the official Twitter app was faster to load and refresh. Other bundled apps include Poynt and Hookt, though oddly Samsung omitted the obvious: Android's native Facebook application, which we promptly downloaded ourselves from Android Market. With a $180 price tag, you'll get the Prevail for a song given what you'll otherwise pay for a smartphone off-contract (upwards of $500, usually). Along with the affordable $50 monthly unlimited data plan, we were inclined not to be snobbish about the details -- a plastic finish here, a lower-resolution camera there. But we just can't excuse a touchscreen so finicky that we were constantly selecting the wrong link, email, or map destination, and even making mistakes in games. 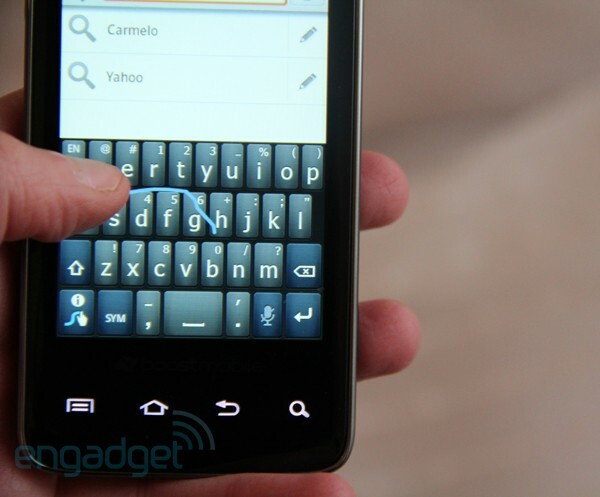 Even once we swapped out the oversensitive Swype keyboard for the more reliable stock one, we spent more time than usual on simple tasks, such as composing emails. We're not above saving money on middle-of-the-road handsets, especially as a means to dirt-cheap data plans. But a phone that will slow you down isn't worth it.